Dr Tania Anne Woloshyn was a Wellcome Trust Research Fellow in the Medical Humanities, based in the Centre for the History of Medicine (2012-2016). Following the completion of the project, she became an Associate Fellow of the History Dept. ‘Regenerative Tanning: Pigmentation, Racial Health and the cure de soleil on the Côte d’Azur, c.1890-1936,’ in Fae Brauer and Serena Keshavjee, eds. Picturing Evolution and Extinction: Regeneration and Degeneration in Modern Visual Culture, Cambridge Scholars Publishing, 2015, pp.193-216. ‘Towards the Light: Histories of Photography and Phototherapy,’ in Nicolai Howalt, Light Break: Photography/Light Therapy, exhibition catalogue. Copenhagen: Fabrik Books, 2015, pp.11-27. 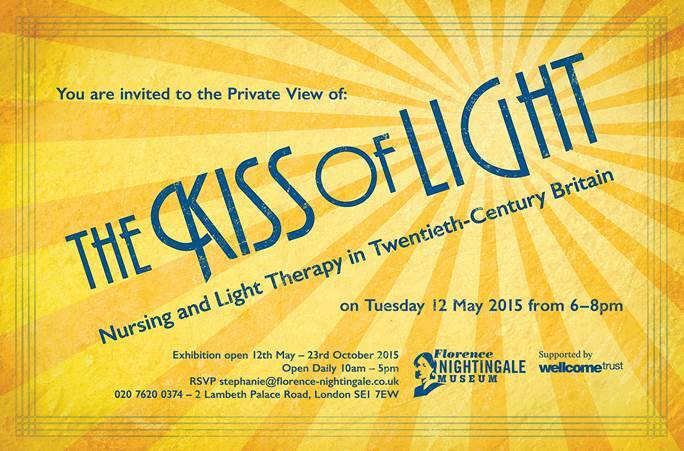 The Kiss of Light: Nursing and Light Therapy in 20th-C. Britain, exhibition guide. London: The Florence Nightingale Museum, 2015. 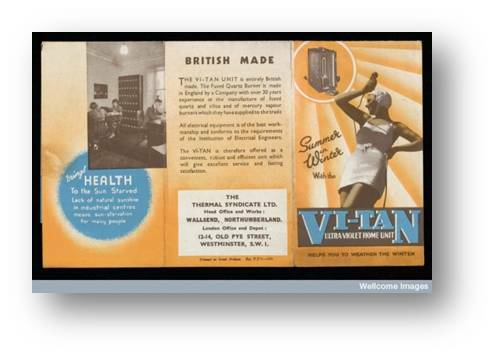 ‘Soaking Up the Sun’s Rays: Light Therapeutics and the Belief in a Healthy Tan,’ Wellcome History, issue 53 (Summer 2014), pp.6-7. ‘Patients Rebuilt: Dr Auguste Rollier’s Heliotherapeutic Portraits, c.1903-1944,’ in 'Patient Portraits,' a Special Issue of Medical Humanities, vol.39, no.1 (June 2013), pp.38-46. ‘“Kissed by the Sun”: Tanning the Skin of the Sick with Light Therapeutics, c.1890-1930,’ in Kevin Siena and Jonathan Reinarz, eds. A Medical History of Skin: Scratching the Surface, Pickering & Chatto, 2013, pp.181-194. ‘Le Pays du soleil: the Art of Heliotherapy on the Côte d’Azur,’ Social History of Medicine, vol.26, no.1 (February 2013), pp.74-93 (accessible online as of 30 July 2012). ‘Colonising the Cote d'Azur: Neo-Impressionism, Anarcho-Communism and the Tropical Terre Libre of the Maures, c.1892-1908’ and ‘Introduction’ (with Anne Dymond) in ‘New Directions in Neo-Impressionism,’ RIHA Journal, guest edited by Tania Woloshyn and Anne Dymond, Special Issue, Summer 2012. ‘Zone of Transition: Visual Culture and National Regeneration on the French Riviera, c.1860-1900,’ in Tricia Cusack, ed. Art and Identity at the Water’s Edge, Ashgate, July 2012, pp.161-176. ‘Aesthetic and Therapeutic Imprints: Artists and Invalids on the Côte d’Azur, c.1890-1910,’ Nineteenth-Century Art Worldwide, vol. 11, no. 1, Spring 2012. ‘Marking out the Maures: Henri-Edmond Cross on the Côte d’Azur, c.1891-1910’ (pp.57-71) and ‘Introduction’ (with Nicholas Hewitt, pp.1-6), in Tania Woloshyn and Nicholas Hewitt, eds., ‘L’Invention du Midi: The Rise of the South of France in the National and International Imagination,’ a Special Issue of Nottingham French Studies, vol.1, no.50, Spring 2011. ‘Our Friend, the Sun : Images of Light Therapeutics from the Osler Collection, c.1900-1945,’ exhibition guide. Montreal: Osler Library for the History of Medicine, McGill University, January 2011, pp.1-23. ‘Strategies for Fostering Independent Learning through Small Group MA Art History Seminars,’ Case Study in the ‘Resources’ section of the Art Design Media (ADM) Subject Centre website. ‘Enter the Art Historians : a Case Study on the Intersections of Art and Medicine,’ Wellcome History, issue 42, Winter (December 2009), pp.18-19. ‘La Côte d’Azur: the terre privilégié of Invalids and Artists, c.1860-1900,’ French Cultural Studies, vol.20, no.4 (November 2009), pp.383-402. How was light medicalised, and how was that visualised? How did the earliest imagery, objects and literature disseminate, legitimise, and contribute to the reception of light therapies as valid medical practices during their emergent years in Britain, c.1899-1938? How does that visual material expose the complexities of light therapeutics and the engagement of practitioners and patients with them?